In the 14th and 15th centuries, Mystras was the capital of Peloponnesus and it has rich history that document the period that was under the Ottoman rule. It has medieval ruins that sit on a beautiful landscape surrounded by greenery. 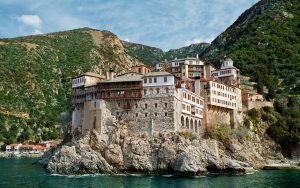 This mountain lies in the Northern Greece peninsula and it has about 1400 monks who use it as a place of worship. Even though it is extremely popular, only men are allowed inside Mt. Athos. Stretching for lose to 16 kilometers, the Samaria Gorge is a long canon that make up the beautiful nature that defines Greece. Walking through the gorge will take you an average of five hours. You will go through forests that have scented cypress trees, pines and other indigenous trees. You will end up at the magnificent Libyan sea at the end of the cliffs. This beach is known for the magical mix of blue and turquoise water that create a shimmering effect. The contrast of the white sands along the beaches and the blue sea is a sight to behold. At the background, you will see mountains that render a beautiful scenery. It is no wonder that Myrtos beach has been voted the best beach in Greece; more than 10 times. If you are visiting Athens, you should not fail to visit the Parthenon temple. It sits on top of the Acropolis and its construction started around 447 BC to replace the temple that was there before but was replaced by the Persians.